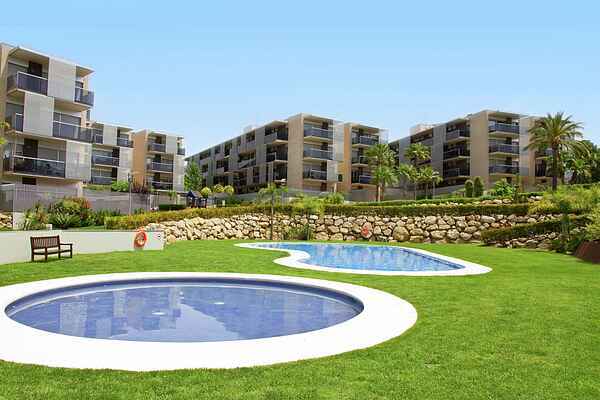 This brand new, beautiful apartment building complex is peacefully situated in Salou. The hustle and bustle and fun are easy to find. The centerpiece of the complex is the beautiful swimming pool with separate children's pool. The children have fun in and around the water, while you can top up your tan on a deckchair in the well-maintained, communal garden. The apartment is suitable for 4-6 people. Near the apartment complex is the largest theme park in Spain, Port Aventura (800 m). It is made up of a large tropical water park, a stunningly located Spanish village and mini fun park, Sésamo Aventura. Salou, with its nice city center, a long promenade and beautiful sandy beaches, is 1 km away. Salou additionally has several bays that are ideal for swimming, snorkeling and diving. Feel like getting acquainted with the beautiful hinterland? Then have a drive to the Benedictine monastery Montserrat (80 km). This large monastery complex is located at an 750 m altitude, in the middle of capriciously rocky mountains which hikers and mountain climbers will enjoy tremendously. A little further away is the cosmopolitan city of Barcelona (110 km). From the center of Salou, every few minutes a train departs to Barcelona.